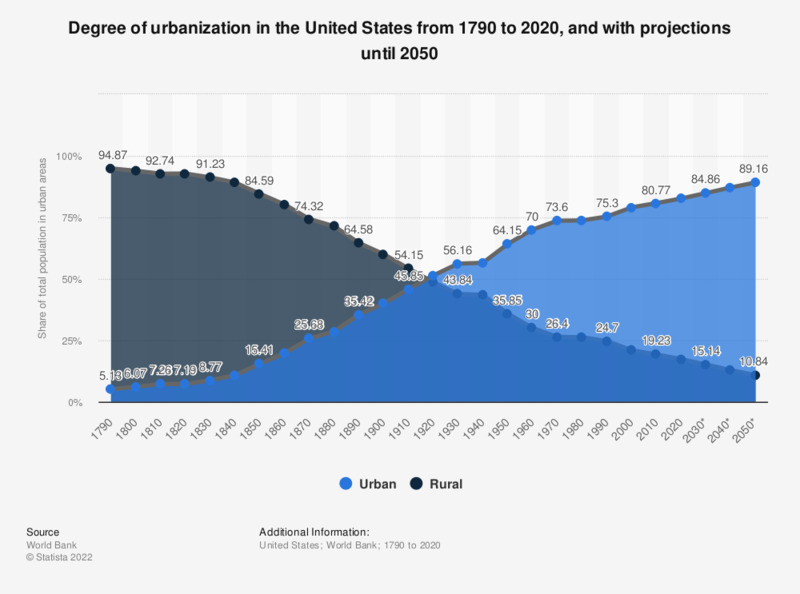 The statistic shows the degree of urbanization in the United States from 1970 to 2015 and details the percentage of the entire population living in urban areas. In 2015, about 81.67 percent of the total population in the United States lived in cities and urban areas. With the United States being populated and inhabited by settlers and migrants quite late in comparison to other nations, urbanization took place a lot later than in other developed nations. Urbanization is defined as the migration of people to the cities (mostly from rural areas, but also from other countries) making the cities larger and more populated. The term ‘Urbanization’ is mainly used in reference to larger cities, it is a phenomenon caused by the migration of people to urban areas in search of better living standards, for example greater job opportunities, better health conditions or housing. Urbanization is one of the factors that has contributed to the abandonment of rural areas and the agricultural way of life in favor of industrial jobs and improved conditions. Many young people from rural areas see moving to the city as a way of enabling them to live their life in the manner that they choose. Urbanization in the States was most prominent on the East Coast to begin with, as it initially served as the main point of entry for the majority of migrants; the gradual settling of other areas of the country followed subsequently. Today, however, Western parts of the United States are classed as being the most urbanized; the majority of cities and urban areas can be found here. The Northeast is also highly urbanized, with New York being the most populous city in the United States. According to the US Census Bureau, out of all US states, only four still have a rural majority: Vermont, West Virginia, Mississippi and Maine.